The Round Rock Express had the last laugh as infielder Nick Tanielu hit a walk-off grand slam in the bottom of the 10th inning to lift the Express past the Nashville Sounds, 9-5, in a back-and-forth game on Wednesday night at Dell Diamond. Tanielu's walk-off grand slam came off Sounds reliever Miguel Del Pozo with nobody out in the bottom of the 10th, and just moments after Nashville squandered a bases-loaded, nobody out opportunity of their own in the top of the 10th. It was a night of missed opportunities for the Sounds as the team failed to take the lead in the ninth despite having Zack Granite at third with nobody out. Granite stood at third after his bases-clearing triple evened the game at 5-5. Starters Ariel Jurado for Nashville and Brady Rodgers of Round Rock were tough on the opposing lineup. Jurado turned in the first quality start by a Sounds pitcher in 2019. He allowed two runs on five hits in six innings. Rodgers was even better as he limited Nashville to one run on five hits in his six innings of work. Despite their efforts, neither starter factored into the decision. Round Rock held a 2-1 lead into the eighth inning before Nashville's Willie Calhoun evened the game with a run-scoring double to left-center. The 2-2 score didn't last long, however, as Round Rock's Yordan Alvarez mashed a three-run homer off Del Pozo with one out in the bottom of the eighth to give the Express a 5-2 lead. 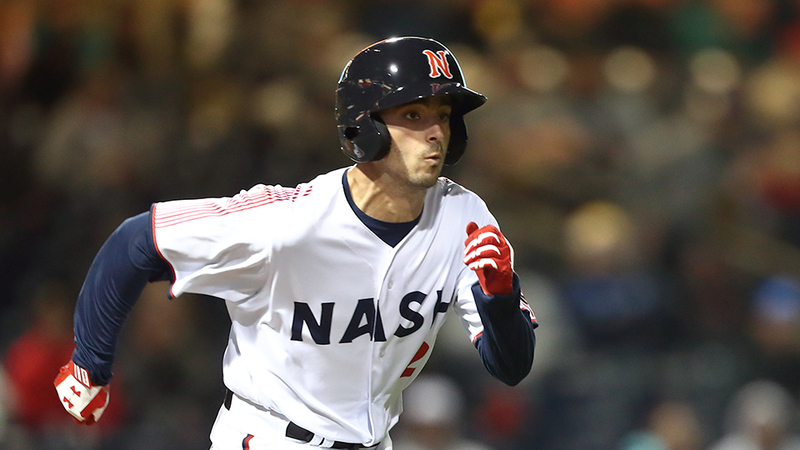 Nashville rallied in the ninth when Round Rock reliever Dean Deetz issued three straight walks to start the inning prior to Granite's clutch three-run triple. Calhoun, Carlos Tocci and Andy Ibanez all had multi-hit games for Nashville in the setback. Del Pozo was charged with five runs (four earned) and hit with the loss. The series finale between the two teams is scheduled for Thursday night at Dell Diamond. Left-hander Wes Benjamin (0-1, 3.38) starts for the Sounds against left-hander Ryan Hartman (1-0, 2.25) for the Express. First pitch is scheduled for 7:05 p.m.
- With tonight's loss, the Sounds dropped to 2-5 on the season. - Tim Dillard struck out three batters tonight to give him 337 with the Sounds. He is now 15 shy of matching the franchise's all-time strikeouts mark set by Jamie Werly. - Andy Ibanez collected a second inning single and has hit safely in all four games he has played in. Ibanez is hitting .563 (9-for-16) since joining Nashville.